Discover an easy way to have fresh, youthful skin without using chemicals. Our microfiber bath mitt is a wonderful way of pampering your body while restoring or maintaining your skin's natural, youthful radiance. Through a process of dermal exfoliation, or microdermabrasion, this mitt deep cleans your skin, leaving it fresh and revitalized. You can use it with water alone, or apply your favorite soap, body wash or face wash to clean any part of your body. Our Exfoliating Mitt will clean dirt that most other cloths leave behind. The mesh style microfiber gently removes dead skin cells and excess oils without being abrasive. Use it to smooth those little problem areas like the elbows, knees and feet. Or use it everywhere to leave your whole body feeling clean, rejuvenated and fresh. Stop using chemical peels that may burn your skin, or corundum crystal mixed with some cream that can clog your pores. No more sandblasting with aluminum oxide crystals. Start using microfiber for all your skin exfoliation needs. Your path to fresh, youthful skin is just one click away. One size fits all. 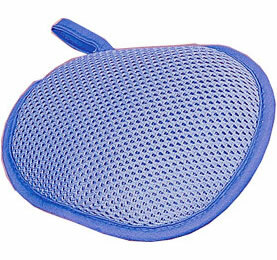 Regular use of this microfiber bath mitt can stimulate blood flow, and lead to better overall circulation. This will leave your skin glowing, even in the dead of winter. Daily exfoliation will also reduce the frequency of ingrown hairs. By removing this unnecessary layer of dead skin your hair will be able to grow normally, instead of being forced to grow through areas of built up oils. The process of exfoliation is also known for it's ability to prolong suntans and allow for a more even tanning overall. It can also stop the coagulation of cellulite which causes orange peel skin, and slows down the ageing process by drawing out waste products that lie in the tissues near the surface of your skin. Use it over and over. Smoother and more radiant skin is easily attainable with this unique bath item. This exfoliating mitt is completely washable, incredibly durable, and will last for years. Get Yours Today! Dimensions (l x w) 5.8" x 4.74"
Exfoliating Bath Mitt - The best way to deep clean your skin. Exfoliate and remove unwanted dead skin cells with this handy little scrubbing tool. Your skin will feel soft and revitalized when you wash with this microfiber mitt. Order Yours Today! Highly effective, and super convenient. Dy glass doors, mirrors, tiles and other surfaces to a spot-free shine.